A New York Times bestseller and a Book of the Year for the Evening Standard and The Times. Is getting a little less comfortable the key to living a happier, healthier life? When journalist Scott Carney came across a picture of a man in his fifties sitting on a glacier in just his underwear, he assumed it must be a hoax. Dutch guru Wim Hof claimed he could control his body temperature using his mind and teach others to do the same. Sceptical, Carney signed up to Hof’s one-week course, not realising that it would be the start of a four-year journey to unlock his own evolutionary potential. From hyperventilating in a Polish farmhouse to underwater weight training in California, and eventually climbing Mt Kilimanjaro wearing just shorts and running shoes, Carney travelled the world testing out unorthodox methods of body transformation and discovering the science behind them. 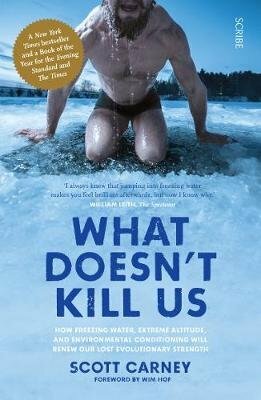 In What Doesn’t Kill Us he explains how getting a little less comfortable can help us to unlock our lost evolutionary strength.